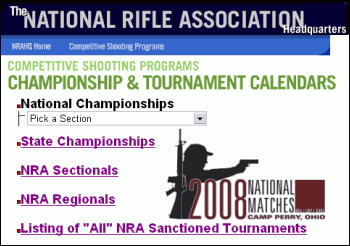 In addition to the events listed in AccurateShooter.com’s Event Calendar, the NRA maintains an online calendar of important matches and tournaments around the county. Click here to access the NRA Calendar and download registration forms for major events. The NRA Calendar includes National championships, State Championships, NRA Sectionals, and NRA Regionals. Disciplines covered include High Power Rifle, High Power Long Range, Smallbore Rifle, Black Powder Target Rifle, Air Rifle and Air Pistol, and Silhouette events for High Power Rifle, Smallbore Rifle, Black Powder Cartridge, Lever Action, and Air Rifle and Air Pistol. Share the post "NRA Event Calendar Available Online"
Both .221 Fireball and 17 Fireball brass have been in short supply for quite some time. Remington is the only producer of Fireball brass, and with the popularity of the new 17 Fireball cartridge, most of the recent brass production went into Remington loaded ammo. Wildcatters have also created additional demand for Fireball brass to make into 20 Vartarg cases. The 20 Vartarg is an extremely efficient cartridge that can drive the accurate 32gr BlitzKing or 32gr V-Max at 3700+ FPS with just 18 to 20 grains of powder. You can form Vartarg cases either by necking-down .221 Fireball brass, or necking up the 17 Fireball cases. As of 4/18/08, Lock, Stock & Barrel has 9800 pieces of 17 Fireball brass in stock, sale-priced at $38.90 per 100 cases. FYI, Grafs.com and MidwayUSA are both currently “out of stock” on 17 Fireball brass. MidwayUSA recently received a large supply of .221 Fireball brass. MidwayUSA now has .221 Fireball cases in all lot sizes: 20, 100, 500, and 1000-count lots. A 100-piece box (item 413527) is priced at $32.99, while a 500-piece box (item 145641) costs $151.99. If you’re looking for large quantities of 17 or .221 Fireball brass, you may want to get your orders in quickly. Vendors are reporting very high demand for the brass. Share the post "17 Fireball and .221 Fireball Brass Now Available"
There are now over 850 Entries in our Daily Bulletin, going back to March, 2007. In our Archives are many “nuggets” you can discover. Here’s a quick guide to our search options. New Calendar Tool: We just added a clickable Calendar to make it even easier to find older Bulletin entries. Just click the date to view the stories for that day. When reviewing the last two or three weeks of entries, you may find it easier to click day by day rather than scroll down a long page. Keyword Search: You can search for any Bulletin item by keyword, such as “Sightron”, or “Camp Perry”, or “6XC”. The keyword search is very fast and effective. Find by Category: In addition, our posts are grouped into categories, such as “Competition”, “Reloading”, and “Optics”. The categories appear at the top right of every Bulletin Page. Monthly Archives: You can also quickly access an entire month’s worth of posts. Just click on the month you want and all the posts from that month will appear, starting with the most recent item (end of month first). 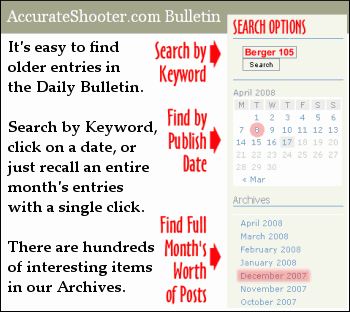 Share the post "How to Use Bulletin Calendar and Search Functions"